“This opens the door to a much wider range of biocompatible implant materials, which can be used to develop customized implant designs using 3-D printing technology,” says Dr. Roger Narayan, senior author of a paper describing the work and a professor in the joint biomedical engineering department at NC State and UNC-Chapel Hill. 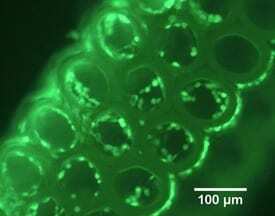 The researchers in this study focused on a 3-D printing technique called two-photon polymerization, because this technique can be used to create small objects with detailed features – such as scaffolds for tissue engineering, microneedles or other implantable drug-delivery devices. Two-photon polymerization is a 3-D printing technique for making small-scale solid structures from many types of photoreactive liquid precursors. The liquid precursors contain chemicals that react to light, turning the liquid into a solid polymer. By exposing the liquid precursor to targeted amounts of light, the technique allows users to “print” 3-D objects. Two-photon polymerization has its drawbacks, however. Most chemicals mixed into the precursors to make them photoreactive are also toxic, which could be problematic if the structures are used in a medical implant or are in direct contact with the body. But now researchers have determined that riboflavin can be mixed with a precursor material to make it photoreactive. And riboflavin is both nontoxic and biocompatible – it’s a vitamin found in everything from asparagus to cottage cheese. April 17, 2019 - First Ever 3D Printed Heart was Made from Human Tissues and Vessels Science TimesResearchers have successfully 3D printed a heart complete with blood vessels, cells, ventricles, and chambers. April 15, 2019 - 3D Printed Medical Implants trends Archives Forex Tribune3D printing, also known as additive manufacturing, refers to addition of successive layers of raw material to produce objects forming three-dimensional file.